Digester gas compression is a complicated process which requires the use of different pieces of equipment that will deliver the results expected from the entire process. As the name implies, it all starts where liquid ring pumps are used to draw out gas from the digester and from there, this will be recirculated in order to improve mixing. There is also an operating liquid in the pumps which cools off the digester gas. This process, as a whole will result to a positive effect on the service lives of motors, gas burners, and downstream valves. It can also reduce maintenance costs. At Airtech Vacuum Incorporated, we can install vacuum and pump technologies for your digester gas compression needs. Anaerobic digestion produces vapor in a sewage treatment plant. This vapor comes from the digestive tank and is comprised of about 55% methane with the remaining 45% attributed to carbon dioxide. These vapors are highly-corrosive and will require the use of a specialized compressor to have the environment dealt with properly. These special compressors can be integrated in packages given to wastewater treatment facilities. Special wastewater compression packages include rotary vane compressors that take charge of dealing with corrosive vapors using a certain amount of pressure in the process. These will then be sent to another system where the once corrosive vapors transform into a more useful byproduct. From there, they can be used to generate electricity for the sewage treatment plant. Others can be used to generate steam for heating purposes while there are those that sends the vapor back to the bottom of the digester tank and can be used for churning sludge. Why Choose Airtech Vacuum Incorporated For Digester Gas Compression? 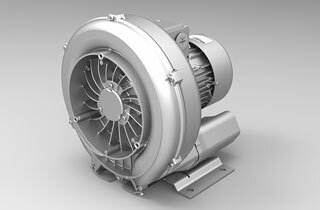 Founded in 1982, Airtech Vacuum Incorporated has been known in the world of manufacturing a variety of vacuum and blower technologies, including high pressure regenerative blowers, variable speed blowers, liquid ring vacuum pumps, and more. We have a dedicated team behind us who works to make sure that various industries will benefit from our unparalleled technology. With us, you can be sure that you will get vacuum and blower systems that are easy to install and operate for the digester gas compression industry. Our technologies are packed with features suited for your specific needs. We have been certified by ISO9001-2008 and our products achieved CSA, CE, UL, and RoHS certification. Our team of engineers begins their work by analyzing each unique situation before recommending the technology that will be useful for the industry. We treat every client with care by paying attention to their needs before ours. We make sure that you are given choices for regenerative blowers for digester gas compression purposes. We also make it a point to handle each order with care in order to meet your expectations. Start browsing through our inventory today and source for top-notch digester gas compression vacuum and pressure products with exceptional ease! Get your products at the most competitive rates in the market.